Natural in form, these stunning exhibits are created with living plants and used as accompaniment to other objects or as standalone displays. These beautiful creations can rival any floral arrangement with a stronger connection to the beauty of nature. Many of the best artist and displays still rise from Japan. Here in the US we often refer to these type of plantings as companion plants or accent plants, but in Japan they distinguish 5 major forms of display each with a different presentation and application. Kusamono are traditionally potted arrangements of wild grasses and flowers in unique pots or trays. The name is composed of two Japanese characters-- “grass” and “thing”—which together suggest humble, everyday plants or even weeds, however the art of kusamono has developed beyond is humble origins. Today the term kusamono is used when the accent plants are exhibited as the focus. Kusamono can be tall, mixed plantings or all the same plant, in or out of a container. The kusamono determines the impression of place and season, such as a meadow, a bog, or the mountains. The closes cousin to kusamono, shitakusa is the correct term with exhibited with bonsai or similar displays. Outside of Japan you will commonly hear the term companion or accent plant, however complementary plant may be most appropriate as shitakusa is not meant to be the dominant focus of the presentation. 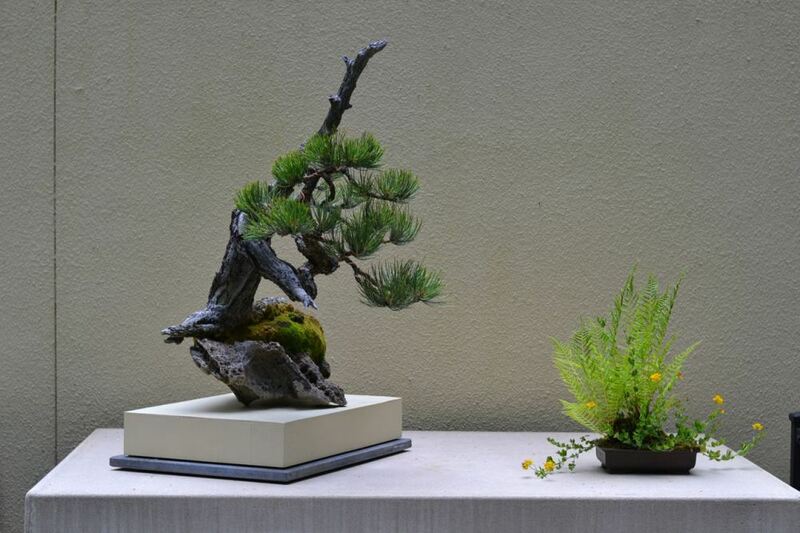 Rather, it is intended to complete the exhibit of the main focus, which can be a bonsai, a suiseki, and/or a scroll. Kokedama, which in English translates literally "moss ball", is a ball of soil, covered with moss, on which an ornamental plant grows. The idea has its origins in Japan where this garden art is centuries old and is tied into the practice of bonsai, but it has grown into its own art form. Today Kokedama are displayed as the center of attention, typically affixed to a piece of driftwood or bark, suspended from a string, or nestled in a low attractive container. Nearai is a term, and form, not commonly seen outside of Japan. Nearai refers to a single plants or mixed plantings that have been grown in pots and when the pot is full of roots it is removed and displayed on a flat container. The purpose of this form is to showing the roots which can be washed to expose them for a more dramatic effect. Often Shitakusa, Kusamono or Kokedama can and will eventually develop into Nearai. Wabi-kusa is the most modern concept of plant display and has roots deep in the aquascaping community. There is no literal translation of ‘Wabi-kusa’ in English. ‘Wabi’ denotes something aesthetic, imperfectly beautiful and natural and ‘Kusa’ means ‘grass’ or sometimes ‘plant’. The term denotes something natural, beautiful, sweetly imperfect and involving plants. Specifically Wabi-kusa are standalone displays of balls of substrate that are covered with plants that are grown in their terrestrial form. These substrate balls are placed directly into a small glass container with some water and allowed to grow naturally.